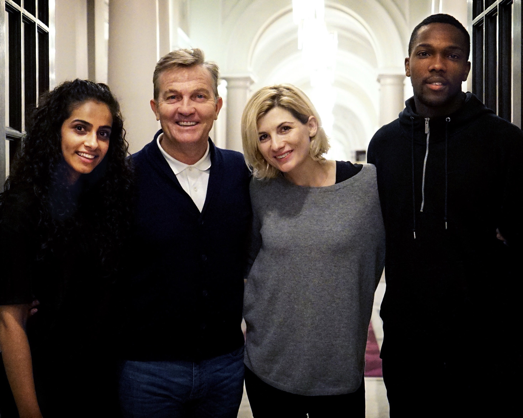 Bradley Walsh, Tosin Cole, and Mandip Gill are joining Jodie Whittaker. BBC America has announced the full cast for the latest iteration of “Doctor Who,” which stars Jodie Whittaker as the Thirteenth Doctor. Joining the first-ever female Doctor will be Bradley Walsh as Graham, Tosin Cole as Ryan, and Mandip Gill as Yasmin; all are new additions to the cast. In addition, Sharon D. Clarke will have a recurring role. Chris Chibnall (“Broadchurch”) serves as the head writer and executive producer of “Doctor Who,” which will come back for a 10-week run of 50-minute episodes next fall. “The new Doctor is going to need new friends. We’re thrilled to welcome Mandip, Tosin and Bradley to the Doctor Who family,” says Chibnall in a statement. Whittaker is taking over for Peter Capaldi, whose tenure as the Doctor will conclude with this year’s “Doctor Who” Christmas special.